Influential Cleveland, Ohio-based metal pioneers MUSHROOMHEAD will release their upcoming DVD, VOLUME III - a follow up to the widely-acclaimed DVD's Volume 1 (2005) and Volume 2 (2008) - on August 17, 2018 via Megaforce Records. The DVD will feature over 90 minutes of new material - including stunning new music videos, backstage antics, and exclusive never-seen-before content. Pre-orders are available now via Amazon. 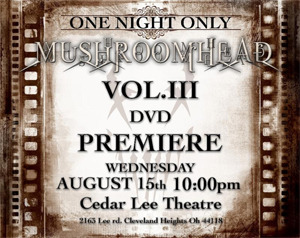 In celebration of the release of VOLUME III, MUSHROOMHEAD will host an exclusive, one-night-only screening/premiere of the entire DVD in their hometown of Cleveland at the Cedar Lee Theatre (2163 Lee Rd., Cleveland Heights, Ohio 44118) on Wednesday, August 15, 2018. The screening will begin at 10:00 PM and runtime is just under two hours. Tickets are just $25 and are available for purchase HERE. Get your tickets now - seating is limited. Producer/drummer/founder Steve "Skinny" Felton says, "Members of our team originally wanted us to do this premiere in LA or New York, but Cleveland is our hometown and we want to represent! Our local fans are the people who made us who we are today, and this is a once in a lifetime event. I'm excited to see how VOLUME III translates to the big screen... we've never done this before, so it's an entirely new version stage fright, ha! Good thing Cedar Lee has a bar!" The following day on August 16, MUSHROOMHEAD will take part in a special DVD signing at The Exchange in Parma Heights, Ohio (6277 Pearl Road - in the greater Cleveland area). The signing will take place from 7:00-10:00 PM and will feature the band members in full costume. Please note that DVDs will be available for purchase at the signing, and a DVD must be purchased for access to photos and autographs with the band. For more information on The Exchange in Parma Heights, visit this LINK. In celebration of the DVD release, MUSHROOMHEAD will headline The Summer of Screams tour this summer, presented by Scream Factory and Dread Central. See below for all confirmed tour dates.